Preheat the oven to 180ºC/350ºF/gas 4. 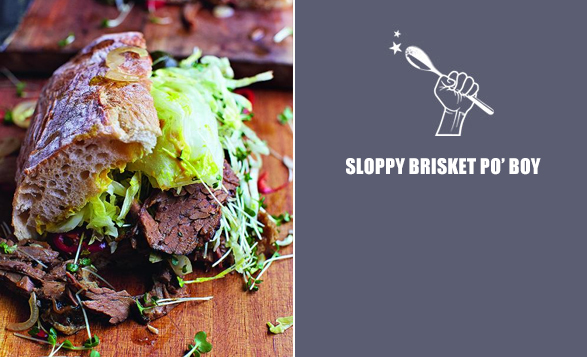 Heat the leftover gravy from the mothership recipe in a pan or tray on a low heat with enough boiling water to loosen, stirring occasionally, then either slice or pull apart the brisket and add it to the gravy for a few minutes. Meanwhile, place the ciabatta in the oven for 5 minutes to warm through. Once warm, cut the ciabatta in half lengthways (so you end up with two wide halves) and spoon the leftover meat and as much gravy as you like over the base. Slice up the dill pickles, pickled onions and chilli and dot over the top. Shred up and pile the lettuce and some retro cress (if using) on top for a bit of crunch, then spread the mustard on to the top side of the ciabatta. Sandwich together, slice into four and shove it in your gob. Feel free to dip your sandwich in any extra leftover gravy. Tip: This style of sarnie works really well with pretty much any leftover meat and, of course, can be done in individual baps if you prefer.